Founded in Paris in 2014, the Chloé Nègre Studio was born from a desire to create a research space for interior design projects, furniture creation and scenography. The studio’s mission is to invent spaces and identities unlike anywhere else. No conforming. No repetitions.While intuition leads to that first creative impulse, providing a vision of a space, the studio’s subsequent intervention process is to rigorously organise. The studio's recent project the Hotel Bienvenue (which is the hotel we are staying at the very moment so stay tuned, review is coming soon) is the work of Chloé Nègre, a former interior designer of the India Mahdavi Studio. We've talked about Paris, her dream project and much more. 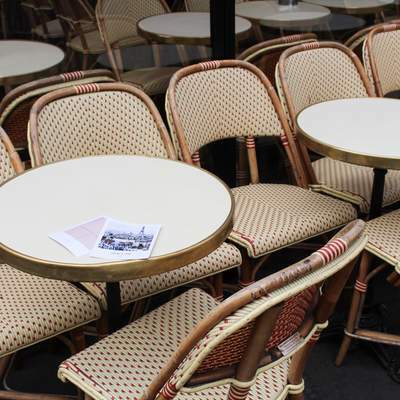 Read her inspiring thoughts and start planning our Parisian getaway. What's common in Boot café and Ob-La-Di? Well, both' menu is so delicious that people tend to queue before opening hours. We are saying this not to deter anyone, just to prove ourselves right. Our addiction towards these places started the last time we visited Paris, but now it evolved completely. Boot is very tiny, yet hearty coffee place just a corner away from the famed concept store; Merci (which we happened to visit after a perfect cappucino with double dash of espresso). Paris is all about the cosy little places and nice walks. It does not matter whether it's raining or there is constant sunshine, Paris is just charming, we can agree on that. So as it's booming boutique hotel scene. In the 9th district you will find the intimate and highly coveted hotel called Hotel Bienveue, which is the freshest project of Adrien Gloaguen (Hôtel Paradis and Hôtel Panache). The place is just the perfect nest for design-savvy travelers with crave for modern aesthetics and comfort. Amongst other things an outdoor terrace - which was our favourite spot in the hotel other than our room's window facing a huge gothic rose window tracery - for eating, drinking and relaxing provides your serenity during your stay. The hotel's location is ideal too; close to both the La Palais Royal and the Sacré-Cœur. So if you were wondering where to stay in Paris whether it is the Maison & Objet or the Fashion Week, we would highly recommend Hotel Bienvenue. On the occassion of Maison & Objet we are flying to Paris in search of interior heaven. But already before taking off, we've fallen in love with the Paris-based designer, Emmanuelle Simon's Rakù-Yaki Cabinet Bar. And it turned out that she's a lot more to showcase. We've found Simon's project called La Chambre sur l'Eau' Bedroom, which she completed during the famed 'Design Parade', held annually by Villa Noailles in Hyères and Toulon located in the South of France. Emmanuelle not only has the eye for the right balance of being artsy yet standing with two feet on the ground, but an extremely sharp eye for detail. Set in a natural palette, one can easily pay attention to all the delicate details used for turning an empty space into a much coveted bedroom that would one spend a lifetime in. She's by the way got the city of Toulon Public Prize. Read her thoughts on being an interior designer, about the art of minimalism and Paris; the most inspiring city one can live in.